Does 682 have a floor? No. Most of our customers want to use it with furniture such as a picnic table which would puncture the floor. It does have a "sod cloth" which is a 6" piece of material that is sewn to the wall and lies on the ground around the perimeter inside the tent. This seals gaps due to uneven ground against flying insects. Many of our customers lay a tarp or indoor outdoor carpeting over this sod cloth to have a removable floor. Is just the rainfly for the 682 available for purchase? Looks great. How much do we need to shell out to purchase this? What happens if for some reason we damage or puncture the rainfly? Can we purchase only the rainfly if ever? Just wanted to report back that we love the screen tent. We purchased it back in the early summer and have had it out a few times. Although we can't set it up quite like the video, we have found that one person can set it up with ease by using the top of a picnic table to give you some vertical height. Anyway, the tent is great, the rain fly and side walls wonderful and the ease of set up and tear down is fabulous! Thanks too, for answering all my questions before the purchase. Thank you lots, Kevin! I’ll keep it mind. I really appreciate the help. Our screen tent 682 has a zip carry bag with packed dimensions of 42"L x 16" diameter when packed with all 8 awning poles. We are about to purchase this tent but, we have one on answer question. Do the flaps zippered or attached to the tent or the Rainfly it self. 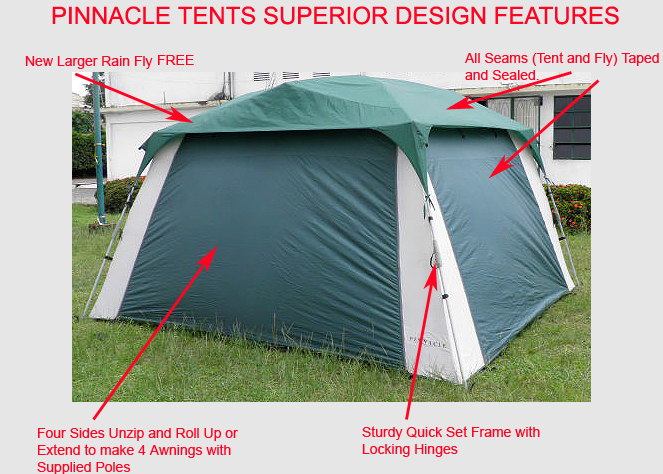 The 4 sidewalls/awnings are attached to the tent and zip closed. They are independent of the rain fly.